CS4-12 Four-channel generator, each channel capable for 12 metals. 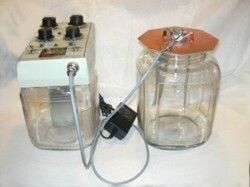 Notes: The basic colloidal generator does not include electrodes, power adapter, magnetic stirrer or zapper. These options can be added according to your requirements. Our most common four channel multi-metal configuration is shown above.The package selected is our most commonly chosen and can be easily changed as you wish.